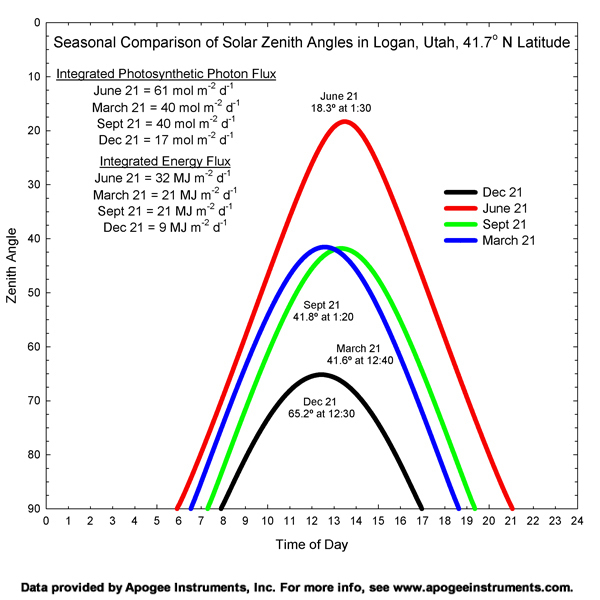 This graph illustrates the year-round variability of global horizontal irradiance at Apogee Instruments in Logan, Utah. As the winter solstice fast approaches, so do the shortened days and lengthy nights. In fact, I've already begun to notice that I'm coming and going from work each day in darkness. 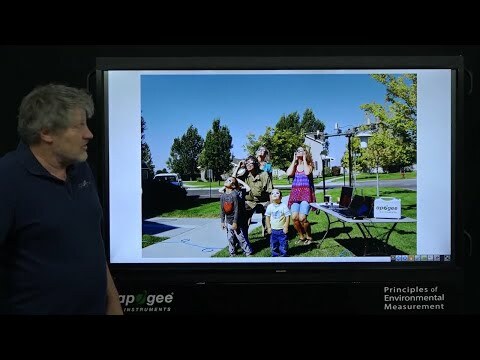 Here in Logan, Utah our latitude of 41.7° N means that by the time the solstice arrives on December 22, 2011 we'll have a solar zenith angle of 65.2°, or an angle above the horizon of 24.8°. The following graph illustrates the difference in solar radiation that northern Utah receives from winter to summer. This time of year tends to bring a renewed challenge to my own circadian rhythm, so for me it's not hard to imagine that certain greenhouse crops and even our own nonnative houseplants are experiencing a similar effect during the winter months. Many greenhouses will provide supplemental lighting to better control the photoperiod that each crop receives. Since growth is determined by the total integrated amount of photons that a plant receives each day, this daily light integral must be measured to accurately predict plant growth. A basic quantum meter can be used to measure the instantaneous photosynthetic photon flux (PPF) in micromoles of photons per meter squared per second (µmol m-2 s-1), but ultimately it is the sum total of moles of photons per meter squared per day (mol m-2 d-1) that must be quantified. Under constant electric lights the conversion from µmol m-2 s-1 to mol m-2 d-1 is straightforward. It is determined by multiplying the instantaneous PPF by the number of seconds in the photoperiod. One of the most highly used section of our website shows examples of this calculation: http://www.apogeeinstruments.com/conversions/daily.html. It’s not possible to use a constant multiplier with variable lighting, so a quantum meter that has an integrating capability is necessary to determine the daily light integral under variable lighting. The Apogee MQ series meter is designed to measure and store this value each day. Once an accurate measurement is made it is important to interpret that measurement – it's nice to know that those impatiens are getting 10 mol m-2 d-1, but is this enough to grow healthy plants? There are a number of online resources available that will provide optimal lighting levels for various plants and food crops. One was developed by Jim Faust’s group at Clemson University: http://www.clemson.edu/hort/peach/pdfs/FaustHortScience2005.pdf. Another was developed by Purdue University: http://www.extension.purdue.edu/extmedia/HO/HO-238-W.pdf. Pages 5-7 include a table listing species of plants and the associated range of acceptable daily light integral values. In the end, measuring daily light integral will help to determine the need to manipulate our environment to get high quality plant growth in the winter. It’s just too bad that I can’t walk around with my own supplemental lighting to help alleviate the long, dark winter nights.